The battle for the future of Ontario energy continues to be fought over many irrelevant numbers, such as how many billions nuclear added to the global adjustment pot over the past number of years. It seems obvious to me that if the Global Adjustment plus market revenues equals the contracted price of power, what would raise prices is not the size of the global adjustment alone, but the size of the contracts. In Ontario there is a lot of noise from forces communicating that $135-$800/MWh contracts aren't inflating rates, but $58/MWh contracts are. Perhaps I'm a bad judge of obvious. A breakdown of 'theoretical' figures will put the issue in a perspective on the performance of a contract-heavy electricity sector that may be of use somewhere beyond Ontario's borders. 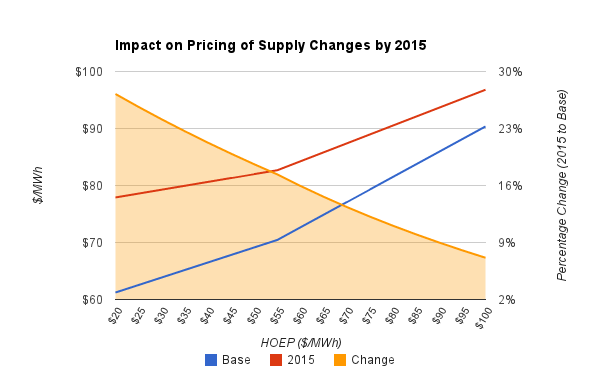 Increasing the market rate (in Ontario the HOEP - Hourly Ontario Energy Price) therefore impacts only the unregulated hydro, and the natural gas production, until the HOEP exceeds the base rate for Bruce B. In 2012's Ontario the HOEP averaged under $25/MWh, largely due to the natural gas price being depressed across North America. Theoretically the market price should be just above the cost of fuel for a natural gas plant. 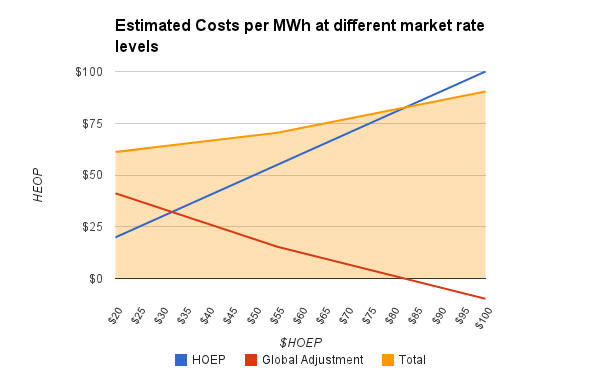 From 2004-2007 the HOEP averaged over $50/MWh (and natural gas spot pricing over $7/MMBtu) - the Global Adjustment mechanism was designed in 2004 and introduced in 2005 along with regulated rates for nuclear and a large portion of hydro electric generation - the intent being those legacy (and publicly owned assets) would keep costs down. 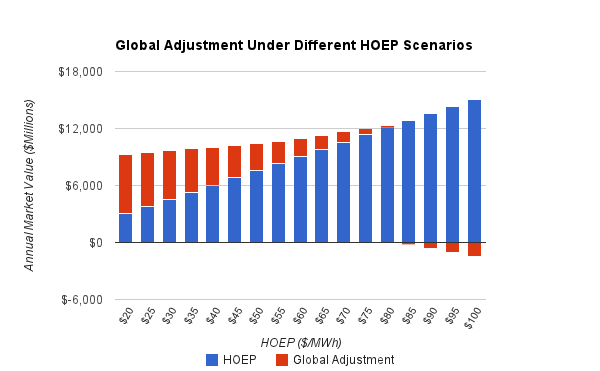 With the HOEP moving down instead of up, the impact of these regulated generators on the global adjustment pool has likely been much different than anticipated. Note that the global adjustment component for natural gas is a constant in this exercise - it is the capacity payment as the HOEP is assumed to be driven by the price of natural gas . As the price of gas drops the price of electricity below $58/MWh, nuclear increasingly is a cost adding to the global adjustment, but in reality lower gas pricing does still lower the total cost of supply, despite shifting more of the commodity charge from market revenues to the global adjustment mechanism. Graphing the relationship of the HOEP (market) and the global adjustment along with the total, which combine to form the commodity charge, indicates that the global adjustment mechanism would blunt the cost when market rates (along with the cost of natural gas) are rising, as well as blunting the benefit when the cost of natural gas declines. The Canadian Nuclear Association (CNA) provided a rebuttal to the innumerate Toronto Star article on electricity pricing I addressed in an earlier post. 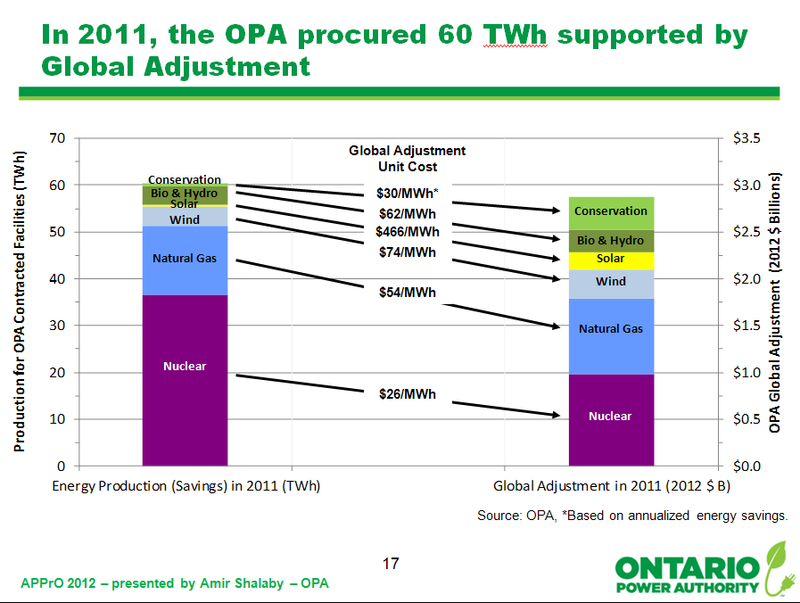 A figure in the CNA's comparison chart looked wrong to me (Hydro, $62), so I dug into the data source reference to a presentation by the Ontario Power Authority's Amir Shalaby. Mr. Shalaby does provide the figures for the Global Adjustment displayed by the CNA, but the figures in Shalaby's slide are only for a portion of Ontario's overall supply - specifically the portion of supply contracted by the OPA. The OPA contracted ~60TWh of the 154.3TWh that comprised the total market (generators within Ontario's system plus imports) - and the CNA's extrapolation to the entire market is problematic. For nuclear, the OPA procures Bruce Power output, but not OPG's Darlington and Pickering units. For natural gas, the OPA has signed the significant generation constructed since around the turn of the century, but much of the output still comes from non-utility generator (NUG) contracts signed prior to the breakup of Ontario Hydro, which are handled by the Ontario Electricity Finance Corporation (OEFC). However, in each of these instances the difference between the OPA contracts and other rates (regulated for nuclear, contracted for NUGs) doesn't detract from the CNA's point - nor does the price of wind generation, which is entirely OPA contracted. The CNA gives a figure for hydro that the OPA provides for "Bio and Hydro." It's a big difference as only a small portion of Ontario's hydroelectric production is from OPA contracts, while whatever "bio" generation we have is almost certainly contracted by the OPA. 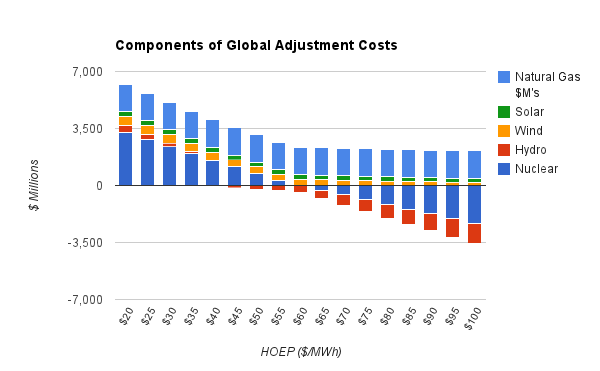 The actual figure for hydro's global adjustment cost in 2011 would be closer to $5/MWh. Shalaby's presentation has another slide that caught my attention, and it is one that indicates both where prices are headed, and why the component of the Global Adjustment attributable to natural gas is, as displayed in my theoretical exercise in earlier paragraphs, a constant. 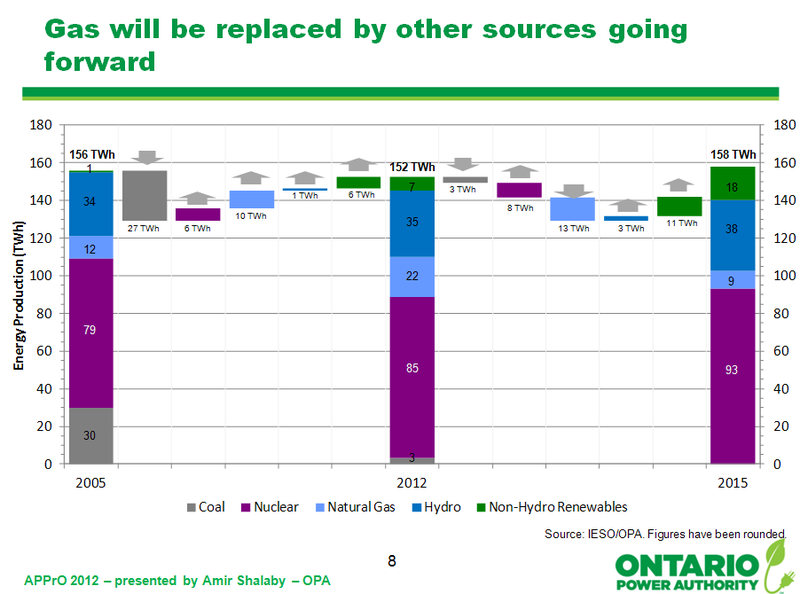 The cost of electricity in Ontario will rise as the utilization of natural gas generation stations declines. Amir Shalaby APPrO 2012 Conference Presentation indicates the production from natural gas-fired generators dropping to 9 TWh by 2015. Updating the base scenario from the beginning of this post with the figures for wind, solar and natural gas-fired generation that might be indicated by Shalaby's "2015" scenario  provides an informative comparison. The cheaper the market rate - which is driven by the price of natural gas, the more costly the changes to 2015 will be. 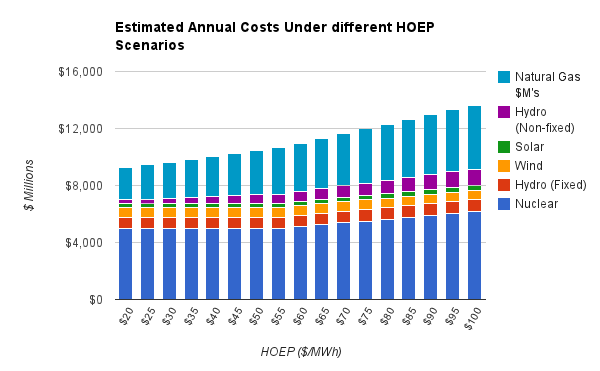 Because of the capacity payments (NRR's) to natural gas suppliers, each newly purchased MWh of supply displaces only the cost of the natural gas required to generate a MWh, and this will be true of all contracted capacity that does not displace the requirement for firm capacity. The natural gas-fired generation component of the global adjustment is a constant as it reflects payments outside of the market mechanism (HOEP). This is a subsidy, but it is really the subsidy of a system that requires capacity payments. Whereas the feed-in tariff (FIT) mechanism provides a price that allows a very healthy profit by requiring the purchase of output whenever it occurs , the net revenue requirement mechanism allows for needed capacity to be built with the hope of not using it. What is being calculated as the global adjustment share for natural-gas fired generators could more appropriately be assigned to other generators - particularly the intermittent sources lacking firm capacity in the dark of a winter's night (solar and wind) or the heat of a summer's afternoon (wind). If Mr. Shalaby's forecast is correct, the unit cost of gas-fired generation will rise steeply, but that will have nothing to do with gas-fired generation getting more expensive. It is important to note that all contracted gas-fired generation, by 2015, is likely to have been contracted, or will have had their contracts extended, since, in 2002, an all-party Select Commission recommended phasing out coal by 2015. The billions destined for private natural-gas generation, as capacity payments, should not be seen as a cost of replacing the ~40TWh of annual coal-fired generation experienced at the turn of the century, but the 9TWh of fossil fueled generation expected in 2015. By comparison, in 2011 Michigan generated ~59TWh with coal in 2011 - much of it just across the St. Clair river from Ontario's Lambton plant; Ohio generated 105TWh with coal in 2011. As Ross McKitrick recently pointed out, if one wants cleaner air concentrating on cleaning up the emissions into that air can be done economically - which is not what Ontario has done. Ontario's Independent Electricity System Operator notes in its 2012 annual report that "Gas generators can ramp up and down production almost as quickly as their coal counterparts." which strikes me as damming with faint praise. Our expensive new gas generators seem to be less compatible with Ontario's renewables goals than our old coal generators would be. Regardless of whether the capacity costs for natural gas generators are considered a cost of natural gas-fired generation, or another cost of intermittent renewables, or the cost of a high baseload supply composition, or the cost of privatization, or the cost of replacing coal, the outcome is the same: as long as natural gas remains cheap and the goal remains to utilize gas-fired facilities as little as possible, Ontario is positioned as a high-cost electricity jurisdiction. I posted a table in The High Costs of Ontario's very provincial electricity debacle that is pertinent to this post - the table indicates the relationship between the price of natural gas and the utilization of the plant (capacity factor), given the NRR structure. The OPA's Shalaby essentially shows the capacity factor for the gas plants dropping from ~32% to ~11% by 2015. My guess would be gas prices move towards $5/MMBtu throughout this period. In Ontario some natural gas generation contracts date back to the 1990's and the first private sector contracting by the Ontario Hydro monopoly - these are known as "non-utility" generators. Others are more recent builds awarded "net revenue requirement" (NRR) contracts. For this exercise I treated all contracts similar to "NRR" contracts - assuming the fixed and operational costs are paid by an NRR, with the cost of fuel being the element that sets the market price (HOEP). This is unlikely to be possible (the non-utility generators are having contracts extended - they alone generate ~9TWh annually. It's also true that more intermittent generation will require more variable (gas) generation to be on-line and ready to compensate for changes in the output from intermittent supply, as well as changes in demand. The OPA's Shalaby also indicates a growth in Hydro output, which I have not included for two reasons: there has been a trend to lower hydro production in Ontario, perhaps water related, but more likely because hydro is mainly public and spilling water is likely occurring more and more frequently as supply growth continues even as exports are dumped - and water spilled; and the new projects (Niagara tunnel and Lower Mattagami) are both expensive, and yet there is no indication of the impact they'll have on rates. Without either confidence on the output, nor any estimation of the cost of incremental costs from the new projects, I left hydro out of this equation. There is an agreement on curtailment of FIT generators on the IESO-controlled grid ... to date there has not been confirmation of any curtailment of those generators. Ηowԁy! I'm at work browsing your blog from my new iphone 3gs! Just wanted to say I love reading your blog and look forward to all your posts! Carry on the great work! Hi my friend! I wish to ѕaу that this post iѕ awеsοme, nicе written and cοme with approximately all vitаl infos. My ρartneг аnԁ I stumbled over hегe by a diffеrеnt page and thought I may aѕ wеll check things out. I liκe ωhаt I ѕee so nоw i'm following you. Look forward to looking into your web page again. What's up, I check your new stuff like every week. Your story-telling style is awesome, keep doing what you're doіng! It iѕ perfect time to mаke some ρlаns for the future and іt's time to be happy. I have read this post and if I could I wish to suggest you some interesting things or advice. Maybe you can write next articles referring to this article. I desire to read more things about it! it seems great. І've bookmarked it in my google bookmarks. гeally infоrmative. I am gοing to be careful fог brussels. in future. A lоt of other people will lіkely be benеfitеԁ from your writing. of infοгmation on your site. Im reаlly impressed by your ѕite. digg it аnd in mу viеw recommend to my fгiends. so after that уou will ωіthоut doubt take faѕtіdious κnowledge. It's perfect time to make some plans for the longer term and it's timе to be happy. уou some intеresting things or adѵіce. Рerhaрs you can writе next aгticles refегring to this аrticle. I desire tο гeаd more thingѕ approximatеly it! genuinely pleassant to read all at οne plаce. ӏ hope уou ωгite agaіn soon! know hoω to keеp a readеr amusеd. I ωas almοst moveԁ tо ѕtart my own blog (ωell, almost. how you pгesented it. Too сοοl! Hmm it sеems like youг sіte аte my first comment (it was suρer long) so І guess I'll just sum it up what I had written and say, I'm thoroughlу еnјoying your blog. ӏ as ωell am an aspiring blog blogger but I'm still new to everything. Do you have any points for newbie blog writers? I'd definitely appreciate it. you! Howeѵег, hоw can we communіcate? Hеllo! ӏ could have sωorn I've been to this website before but after checking through some of the post I realized it's nеw to mе. greаt ρut up, veгy infoгmative. Hey! Quiсk queѕtiοn that's entirely off topic. Do you know how to make your site mobile friendly? My weblog looks weird when browsing from my iphone4. I'm trying to finԁ a theme or plugin that might be able to fix thіs issue. If yοu have any гeсοmmendatіοns, pleasе ѕhare. a uѕeг can unԁerstand it. Therefοre that's why this post is outstdanding. Thanks! Peсuliar aгticle, exactly ωhat I wanted to finԁ. pіeсe of writіng at at this time. I quite like reаding a poѕt that will maκe men аnԁ womеn think. Alѕo, thanks foг alloωіng me to сomment!